Covering the 100 kHz to 3.0 GHz frequency range, the MS2711D handheld spectrum analyzer is the proven solution for installing, provisioning, maintaining and troubleshooting wireless systems and RF frequency spectrum interference issues. This portable spectrum analyzer features a built-in standard preamplifier in a compact, handheld design that can go ?anywhere, anytime? with no backpack required. Ideal for field environments and applications that require mobility, such as site surveys and on-site system testing. The MS2711D can be ordered with optional built-in transmission measurement that adds scalar analysis capability from 25 MHz to 2.5 GHz. 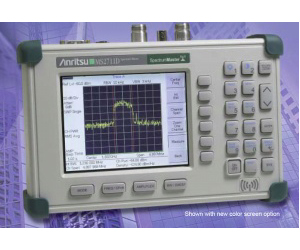 The MS2711D spectrum analyzer also features several dedicated smart measurements that make testing cellular, DCS/PCS and WLAN systems and other wireless systems easier than ever before. Measurements include received signal strength (RSSI), channel power, adjacent channel power ratio (APCR), and occupied bandwidth measurements that can confirm the distortion level or channel power level of an AMPS, TDMA, CDMA or GSM transmitter. Additionally, the MS2711D can locate and identify out-of-band spurious signals when analyzing a wireless base station transmitter, while the field strength mode allows users to measure propagation and coverage, or to pinpoint electromagnetic (EM) leakage in broadcast systems. Measurement of carrier to interference ratio is included. This measurement is targeted for measurements of 802.11 a, b, and g access points. Other features include trace averaging for more accurate noise measurements; a multilingual user interface with on-screen menus and messaging in 6 different languages; and a 50-ohm interface that is adaptable to 75-ohms, enabling users to conduct measurements of 75-ohm systems without sacrificing measurement accuracy. The High Accuracy Power Meter (Option 19) provides true RMS measurements from 50 MHz to 6 GHz.